March 24, 2016 – Scientists working on NASA’s Cassini mission have identified the highest point on Saturn’s largest moon, Titan. Titan’s tallest peak is 10,948 feet (3,337 meters) high and is found within a trio of mountainous ridges called the Mithrim Montes. The researchers found that all of Titan’s highest peaks are about 10,000 feet (3,000 meters) in elevation. The study used images and other data from Cassini’s radar instrument, which can peer through the obscuring smog of Titan’s atmosphere to reveal the surface in detail. “It’s not only the highest point we’ve found so far on Titan, but we think it’s the highest point we’re likely to find,” said Stephen Wall, deputy lead of the Cassini radar team at NASA’s Jet Propulsion Laboratory in Pasadena, California. The results, which use data collected by Cassini’s radar instrument, are being presented today at the 47th annual Lunar and Planetary Science Conference at The Woodlands, Texas. 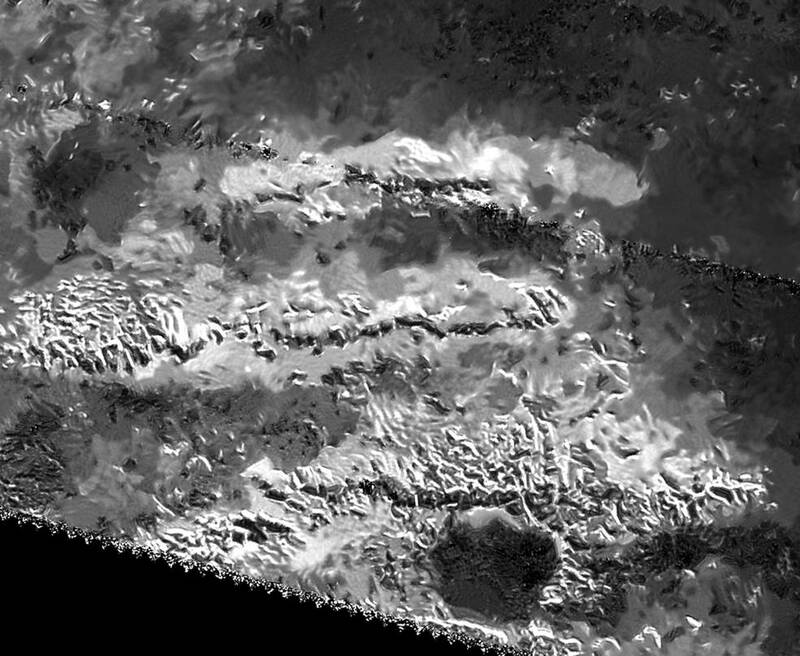 Most of Titan’s tallest mountains appear to be close to the equator. 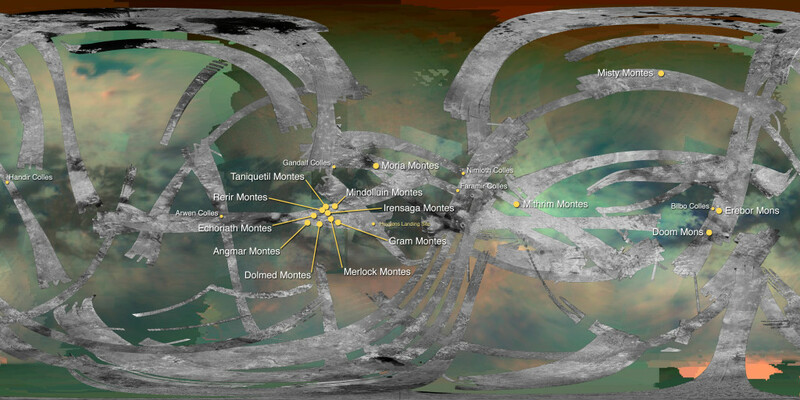 The researchers identified other peaks of similar height within the Mithrim Montes, as well as in the rugged region known as Xanadu, and in collections of more isolated peaks called “ridge belts” located near the landing site of ESA’s Huygens probe. The investigation was originally motivated by a search for active zones within Titan’s crust — places where dynamic forces have shaped the landscape, perhaps in the relatively recent past. “As explorers, we’re motivated to find the highest or deepest places, partly because it’s exciting. But Titan’s extremes also tell us important things about forces affecting its evolution,” said Jani Radebaugh, a Cassini radar team associate at Brigham Young University in Provo, Utah, who led the research. Mountains and cliffs on Earth usually are found in locations where forces have shoved the surface upward from underneath. Forces of erosion, including wind, rain and runoff, slowly wear them down over time. The Himalaya and Andes Mountains are examples of places where interior forces are at work today. The Appalachian Mountains represent much more ancient activity that produced similarly gigantic peaks long ago, which have since eroded. Cassini has found that Titan also has rain and rivers that erode its landscape. According to Radebaugh, the process probably proceeds much more slowly on Titan than on Earth because, at 10 times Earth’s distance from the sun, there is less energy to power erosive processes in the moon’s atmosphere. Titan’s icy crust sits atop a deep ocean of liquid water that probably acts much like Earth’s upper mantle — the layer of hot, high-pressure rock below the crust that can slowly flow and deform over time. Once a period of mountain-building ends, these fluid layers (Earth’s upper mantle and Titan’s liquid ocean) allow the crust to relax, like a person settling into a waterbed. Also, at great depth, the water-ice bedrock of Titan is softer than rock on Earth. Because of these characteristics, scientists didn’t expect mountains on Titan would tower quite as high as those on Earth, which can rise to more than 5 miles (nearly 9 kilometers) tall. The fact that Titan has significant mountains at all suggests that some active tectonic forces could be affecting the surface, for example, related to Titan’s rotation, tidal forces from Saturn or cooling of the crust. The next step for the researchers will be trying to figure out what could produce such tall peaks on an icy ocean world. “There is lot of value in examining the topography of Titan in a broad, global sense, since it tells us about forces acting on the surface from below as well as above,” said Radebaugh. The Cassini-Huygens mission is a cooperative project of NASA, ESA (European Space Agency) and the Italian Space Agency. NASA’s Jet Propulsion Laboratory, a division of the California Institute of Technology in Pasadena, manages the mission for NASA’s Science Mission Directorate, Washington. JPL designed, developed and assembled the Cassini orbiter. The radar instrument was built by JPL and the Italian Space Agency, working with team members from the US and several European countries. The imaging operations center is based at the Space Science Institute in Boulder, Colorado. The University of Colorado’s Laboratory for Atmospheric and Space Physics contributed and operates the UltraViolet Imaging Spectrograph (UVIS) instrument on Cassini.